Shopping for Batman v Superman: Dawn of Justice Action Figures? The Dark Knight immerges as a 10-inch tall Play Arts Kai action figure! From the Batman v Superman: Dawn of Justice movie. Comes with extra hands, a batarang, a grapnel gun, and more! From the Batman v Superman: Dawn of Justice movie, comes the Dark Knight as a Play Arts Kai action figure. The Batman v Superman: Dawn of Justice Batman Play Arts Kai Action Figure recreates an excellent likeness of Batman, from his face to the texture of his body and suit. There are fine details incorporated within the simplicity, and the paintwork shows the care taken in the sculpting shine. Note the roughness of his Batsuit and cape. In addition to the flexible materials used in various parts, rolling joints have been implemented in the upper arms and thighs for a wider range of mobility, allowing for improved poseability. 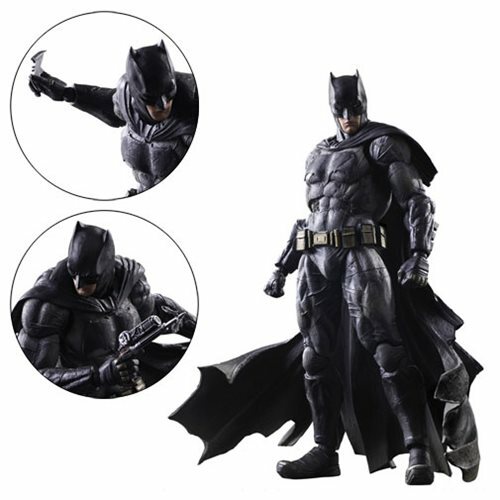 Also included are signature gadgets like the batarang and grapnel gun, plus additional hand parts and a display stand. This plastic action figure stands about 10-inches tall x 7-inches wide x 5-inches long and comes packaged in a window box. Ages 15 and up.